The (reading) public and others who have been following the workings of the Willie Redhead Foundation over the years, will recall the controversy during 2007 when it was discovered, that a foreign real estate speculator intended to build cottages along the narrow strip of land between the lagoon and the Kirani James Boulevard, and the steps that were taken with the assistance of Citizens in defence of Grenada’s lands and heritage and the Lagoon Road Development Committee together with the public to prevent this hostile and un-Grenadian occurrence. In order to accomplish this feat, it would have been necessary to fill a portion of the lagoon; and as the frontage of the cottages would be facing the beautiful vista of the lagoon, in order to justify the high rental or sale prices of the development, the Grenadian public would have been denied the visual ambiance of the placid waters (of the lagoon) and be therefore constrained to look onto the backsides of cottages, as a reward for a few low paying jobs provided to some of our compatriots, while the lucrative ones will be filled by expatriates. 10 years on, the real estate speculator was unable to fulfil his development portfolio (see Port Louis Grenada Life magazine), but is now endeavouring to resurrect the cottages part of the project by having it quietly included in the proposed Blue Economy venture. This venture — as per usual, is thrust upon the unsuspecting public as the gateway to the “promise land.” We have had the New Economy, the Green Economy and now the Blue Economy. While nothing discernible has been derived from the former two, the Blue Economy venture is being presented by its foreign proponents and their local agents, as the one which would compensate for the non-performance of the former two by securing finance from the World Bank to undertake a case study in the first instance entitled: “Toward a blue economy: A promise for sustainable growth in the Caribbean,” together with a detail summary on “Grenada’s Blue Growth Costal Master Plan,” which has been completed and is now on the World Bank website, that promises to secure development finance for its implementation in the future. 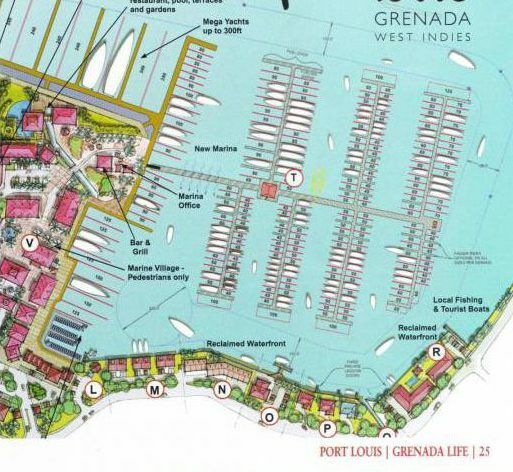 A significant number of projects — of concern to the public at large, that have been proposed for development in the Southwest quadrant of Grenada as shown in the Costal Master Plan are: A five-star hotel in Silver sands (under construction), a hotel on the Riviera site next to Camerhogne Park, Woburn Marina Development, Mt Hartman Hotel/Casino, Mt Hartman Medical Park (started, but abandoned), True Blue Bay Hotel/Casino, Mt Hartman Resorts, Hog Island waterfront community, de Savary’s cottages along the lagoon and the marine protected areas between Sauteurs and Carriacou, including all the Grenadine islands in between. What are the specific inputs from the citizens in these (locations) sites, to ensure project relevance, disenfranchisement of citizens rights, sustainability and local economic benefits, if any? While we accept the concept that we are a part of the global village and that the trade and economic features of globalisation have become a reality — much to the disadvantage of small developing countries like Grenada. That, however, should not relegate us into becoming “intellectual mendicants.” As far as the Sentinel has observed, 43 years after our colonial masters have left, Grenada has been unable or perhaps unwilling to mobilize its intellectual resources in order to design its own homegrown holistic development plan including Heritage and Culture, the glue which binds us together and reinforces our national identity, in order to take us out of persistent poverty, as in the case of Hong Kong, Malta and Singapore. Every large multi-million dollar developmental programme/project that we are called upon to seriously consider, originates from an external source, and what is disturbing is that we are asked to accept them without the genuine involvement of the people whom it would most affect, and to consider whether, in fact, it will contribute to meaningful advancement and development or just another 21st century pretext (recolonization) for enriching an overseas speculator or consortium. In conclusion, the Sentinel would respectfully advise the Government and the so-called developer to respect the wishes of the Grenadian public and refrain from building cottages along the Lagoon road now the Kirani James Boulevard, which should be upgraded as a small recreational park. This area, like Quarantine Point and Camerhogne Park, are part of the disappearing patrimony of the Grenadian people, which must remain sacrosanct, as a public amenity in perpetuity.